I have been trying to get a dictionary , can’t seem to hit on it. Pease help. Really nicely explained…a thorough analysis…Thanx. gr88.. very intrsting n lil confusing too..thnx…finally i got it..
very good explaination which i want. i want to know who wrote this information and what is his dgree pls ? it is very good thing so keep it -up. Really explain in detail, i am very please visiting this web-site. 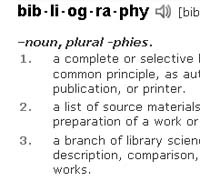 thank you its very useful comprasion between references and bibliography. Really helpful and a very nice one. It will be more effective if the paragraphs are arranged in different points. Thanks you were a great help. I got the information that I needed thanks alot!! Thanks a lot for clearing this up !!! Thanx a lot coz I’m now undurstanding about this.thank u again! So greatful to you guys, thumbs up for you, your information realy left me doubtless. Thanks men. wow dat gud info, it jus help me in my cocs 101 asst. Am so greatful by solving all my assignment without confusion. whao,u guys did it again! I’m sure this will help me in ma exams…thumbs up! This interpretation is really rediculous! I have gotten the actual answer what i am thinking about.thanks a lot! The article has been much useful to we colleagues. Most of college students do not understand the two words thinking that they are synonyms.Thanking you in advance. thank for the good explanation. I love it. tanx, that was well explained. thanks for the info. and u did explain all the things that i want to know …im very glad tha i found this site get this interesting article… i can now start my research and i find a way to get my research more meaningful and success..
Thksss for this article. Really have helped me. Very helpfull to me… i like your explanation…. Gud work ….rock mai day….. It is very helpful for research scholar like me. Thanks very much. Thanks four classification of this two close words.I gott it series.Thank you i hope you well. Thanks for differentiating the words, it really helpful.